Caribbean Miami Beach Condos Stunning views, convenient access to the hottest and most popular venues in Miami Beach and the opportunity to live in one of the most in-demand and affluent neighbourhoods in South Florida. That is what you gain when you live in Caribbean Miami Beach Condos. 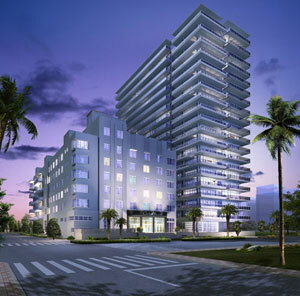 The legendary neighbourhood of the historic district in Miami Beach is known for its glamour and lavish amenities. The Caribbean Hotel is right in the middle of the beauty and glamour that defines this district. Originally designed in 1941, The Caribbean Hotel was one of the most popular spots among wealthy socialites and celebrities alike. Rising to six stories, this historic landmark will be completely renovated and offer 35 ultra luxurious condo units to discerning residents. In addition, there will be a completely new 19 story tower that will be home to 68 completely lavish and well designed residences. There will also be penthouses that will feature swimming pools and rooftop terraces. Sunbathe on the Caribbean's sundeck or swim in the heated infinity edge pool. Play some billiards in the lounge, check out the fitness center with all of the latest equipment, relax in the courtyard, Caribbean has many things to enjoy. The one, two, three or four bedroom residences have generously sized walk-in closets, touchpad panels that allow residents to request concierge services, floor to ceiling windows and much more. The number of amenities that will be offered by the Caribbean include a dizzying array of luxuries and conveniences. An elegant porte-cochere will welcome you into your building and the glamour of a bygone era. A high speed elevator will take you straight up to your residence, where the amenities and luxuries continue. Floor to ceiling glass windows, expansive walk-in closets, touchpad concierge panels, Italian cabinetry in the kitchens and marble and granite bathrooms complete with designer fixtures and whirlpool tubs are all among the luxuries you will enjoy. Throughout The Caribbean, amenities have been selected for the sole purpose of making your life easier. Such amenities include a fire pit that is ideal for social gatherings, four private cabanas, sun decks, a resident lounge, a fitness center complete with state of the art equipment, a whirlpool spa, heated swimming pool and business center. The Caribbean also offers a wine vault with dedicated space for every resident. If you enjoy having a nice glass of wine with your meals, you will have the perfect place for storing your favorite vintages. There is even a cigar humidor for those residents who enjoy a good cigar. To the east of Collins Avenue and in between 38th and 37th Street is the classic Caribbean, a pair of Miami Beach condos for sale within the Millionaire's Row neighbourhood standing nineteen and six stories tall. After receiving extensive renovation, Caribbean is all new yet retains its classic appeal as well as a location just a few feet from the sunny sands of Miami Beach. Explore the many miles of beach near Caribbean or visit what are arguably Miami Beach's two most famous roadways: Ocean Drive and Lincoln Road. Both of these have a huge number of places to explore and enjoy from dining to shopping or dancing or partying. The rest of the barrier island also has many places you may enjoy and you'll find even more in Bal Harbour to the north or to the west in Miami.